The Kimber Pro Carry II 1911 .45 ACP, with matte stainless finish is a gun that I don't own, but have been able to observe in action for about 3 and a half years. The gun belongs to my good friend Matt, and It's been present in dozens of places where I've been with a group of people to shoot for over three years. I've also shot it numerous times with both reloads and factory ammo. Matt hasn't kept up with the rounds put through it closely, but is positive the round count is well into the thousands. I have personally seen hundreds of rounds put through it as well as my own shooting experience with it. 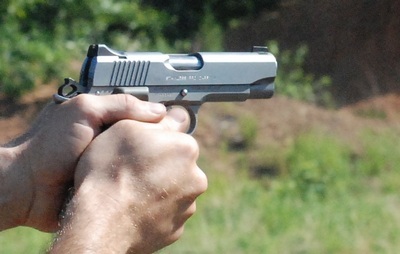 The KPC II 1911 is a commander size pistol with 4" barrel for concealed carry. The slim profile of the 1911 makes it ideal for outside or inside the waistband holsters. 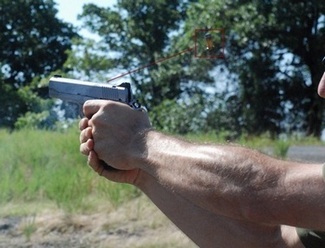 The Pro Carry II, like most modern production 1911 style pistols is safe to carry in "condition one", cocked and locked as long as it is secured in a good quality holster. The Kimber has fired thousands of .45 ACP rounds dependably with no breakage or replacement of any parts on the gun. Interestingly, as fate would have it, a rare malfunction occurred during the shooting session where these pictures were taken, and I call em like I see em. No cover ups here. The Kimber suffered a jam, that had to be cleared before proceeding. It was the only malfunction, but I know that one could be fatal if it was in an emergency encounter. But considering how long this gun has been used and how many rounds have been fired, percentage wise, it's about as good as it gets. All guns will eventually have a malfunction. This one just happened to be when I was reviewing it. 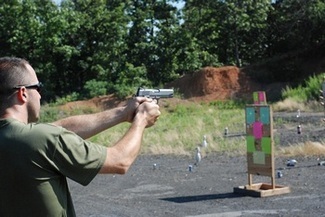 Knowing the performance and history of the the pistol, I would have to give it a very good dependability rating. That in spite of this one malfunction which is the first one I've witnessed in three and a half years. In watching multiple people shoot the gun and shooting it numerous times off hand myself, I can attest to the fact that the gun is a tack driver. It points very naturally and it seems the bullets almost find their own way to the target. The alloy frame keeps the gun light and easy to handle. 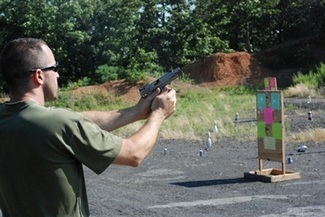 Recoil is standard and very manageable. The matte stainless finish on the gun enables the owner to carry it in all kinds of conditions without worrying about corrosion or rust. Of course reasonable care should be given to clean the gun inside and out to keep it at it's best. This KPC II came with case and two eight round magazines. The gun comes with optional night sights as well as other accessories that can be ordered. BOTTOM LINE: Like all Kimber model pistols, the stainless Pro Carry II is a fine gun, as accurate and dependable out of the box as any that can be purchased of any brand. It is an excellent size and dependable enough to be carried in a wide variety of situations and dress styles. The only regret that I have about this gun is that I don't own one.